Disturbed Thought Processes: The state in which an individual experiences a disruption in such mental activities as conscious thought, reality orientation, problem-solving, judgment, and comprehension related to coping, personality, and/or mental disorder. The diagnosis Disturbed Thought Processes describes an individual with altered perception and cognition that interferes with daily living. Causes are biochemical or psychological disturbances like depression and personality disorders. 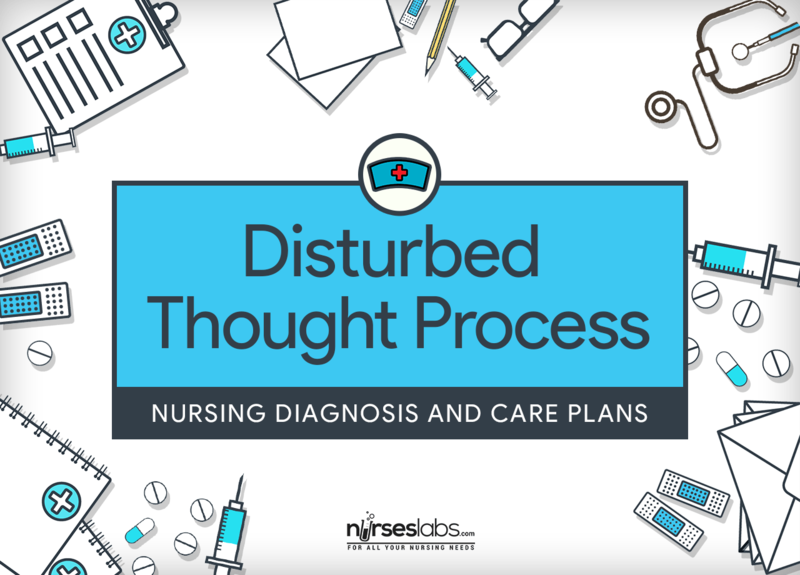 The focus of nursing is to reduce disturbed thinking and promote reality orientation. Often, confusion in older adults is erroneously attributed to aging. Confusion in the older adult can be caused by a single factor or multiple factors such as depression, dementia, medication side effects, or metabolic disorders. Depression causes impaired thinking in older adults more frequently than dementia. Patient recognizes changes in thinking/behavior. Patient recognizes and clarifies possible misinterpretations of the behaviors and verbalization of others. Patient identifies situations that occur before hallucination/delusions. Patient uses coping strategies to deal with effectively with hallucinations/delusions. Patient participates in unit activities. Patient expresses delusional material less frequently. Patient appropriately interacts and cooperates with staff and peers in therapeutic community setting. Identify factors present [acute/chronic brain syndrome (recent stroke, Alzheimer’s disease), brain injury or increased intracranial pressure, anoxic event, acute infections, malnutrition, sleep or sensory deprivation, chronic mental illness (schizophrenia)]. Identifying factors present is important to know the causative/contributing factors. Determine alcohol/other drug use. Drugs can have direct effects on the brain, or have side effects, dose-related effects, and/or cumulative effects that alter thought patterns and sensory perception. Review laboratory values for abnormalities such as metabolic alkalosis, hypokalemia, anemia, elevated ammonia levels, and signs of infection. Monitoring laboratory values aids in identifying contributing factors. Assess dietary intake/nutritional status. This helps in identifying contributing factors. Assess attention span/distractibility and ability to make decisions or problem solve. This determines the ability of the p[atient to participate in planning/executing care. Assist with testing/review results evaluating mental status according to age and developmental capacity. This is to assess the degree of impairment. Interview SO or caregiver to determine patient’s usual thinking ability, changes in behavior, length of time problem has existed, and other pertinent information. This is to provide baseline for comparison. Perform periodic neurological/behavioral assessments, as indicated, and compare with baseline. Early recognition of changes promotes proactive modifications to plan of care. Assist with treatment for underlying problems, such as anorexia, brain injury/increased intracranial pressure, sleep disorders, biochemical imbalances. Cognition/thinking often improves with treatment/correction of medical/psychiatric problems. Reorient to time/place/persin, as needed. Inability to maintain orientation is a sign of deterioration. Have patient write name periodically; keep this record for comparison and report differences. These are important measures to prevent further deterioration and maximize level of function. Provide safety measures (e.g., side rails, padding, as necessary; close supervision, seizure precautions), as indicated. It is always necessary to consider the safety of the patient. Schedule structured activity and rest periods. This provides stimulation while reducing fatigue. Maintain a pleasant and quiet environment and approach patient in a slow and calm manner. Patient may respond with anxious or aggressive behaviors if startled or overstimulated. Present reality concisely and briefly and do not challenge illogical thinking. Avoid vague or evasive remarks. Delusional patients are extremely sensitive about others and can recognize insincerity. Evasive comments or hesitation reinforces mistrust or delusions. Be consistent in setting expectations, enforcing rules, and so forth. Clear, consistent limits provide a secure structure for the patient. Reduce provocative stimuli, negative criticism, arguments, and confrontations. This is to avoid triggering fight/flight responses. Refrain from forcing activities and communications. Patient may feel threatened and may withdraw or rebel. Do not flood patient with data regarding his or her past life. Individuals who are exposed to painful information from which the amnesia is providing protection may decompensate even further into a psychotic state. Identify specific conflicts that remain unresolved, and assist patient to identify possible solutions. Unless these underlying conflicts are resolved, any improvement in coping behaviors must be viewed as only temporary. Provide nutritionally well-balanced diet, incorporating patient’s preferences as able. Encourage patient to eat. Provide pleasant environment and allow sufficient time to eat. These enhance intake and general well-being. Recognize and support the patient’s accomplishments (projects completed, responsibilities fulfilled, or interactions initiated). Recognizing the patient’s accomplishments can lessen anxiety and the need for delusions as a source of self-esteem. Use touch cautiously, particularly if thoughts reveal ideas of persecution. Patients who are suspicious may perceive touch as threatening and may respond with aggression. Use the techniques of consensual validation and seeking clarification when communication reflects alteration in thinking. (Examples: “Is it that you mean . . . ?” or “I don’t understand what you mean by that. Would you please explain?”) These techniques reveal to the patient how he or she is being perceived by others, while the responsibility for not understanding is accepted by the nurse. Engage the patient in one-to-one activities at first, then activities in small groups, and gradually activities in larger groups. A distrustful patient can best deal with one person initially. Gradual introduction of others when the patient can tolerate is less threatening. Encourage patient to verbalize true feelings. Avoid becoming defensive when angry feelings are directed at him or her. Verbalization of feelings in a non-threatening environment may help patient come to terms with long-unresolved issues. Teach patient to intervene, using thought-stopping techniques, when irrational or negative thoughts prevail. Thought stopping involves using the command “stop!” or a loud noise (such as hand clapping) to interrupt unwanted thoughts. This noise or command distracts the individual from the undesirable thinking that often precedes undesirable emotions or behaviors. Encourage patient to participate in resocialization activities/groups when available. This is to maximize level of function. Assist in identifying ongoing treatment needs/rehabilitation program for the individual. This measure is important to maintain gains and continue progress if able. Identify problems related to aging that are remediable and assist patient to seek appropriate assistance/access resources. These encourage problem-solving to improve condition rather that accept the status quo. Assist patient and SO develop plan of care when problems are progressive/long term. Advance planning addressing home care, transportation, assistance with care activities, support and respite for caregivers, enhance management of patient in home setting. Refer to community resources (e.g., day-care programs, support groups, drug/alcohol rehabilitation, mental health treatment programs). These measures are necessary to promote wellness.